The Dispa-SET model is an open-source unit commitment and optimal dispatch model focused on the balancing and flexibility problems in European grids. Its pre and post-processing tools are written in Python and the main solver can be called via GAMS or via PYOMO. The selected Mixed-Integer Linear Programming (MILP) solver is CPLEX. Dispa-SET is mainly developed within the Joint Research Centre of the EU Commission, in close collaboration with the University of Liège (Belgium). 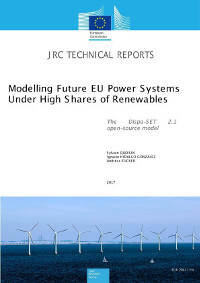 A comprehensive description of the model is available in the 2017 JRC technical report: Modelling Future EU Power Systems Under High Shares of Renewables. © Copyright 2017, Sylvain Quoilin & Kostas Kavvadias. Revision 9c39a2b9.